Want to keep your system running smoothly? The more fragmented your hard drive becomes, the harder--and slower--it works. And over time, a hard drive can be mighty fragmented indeed. 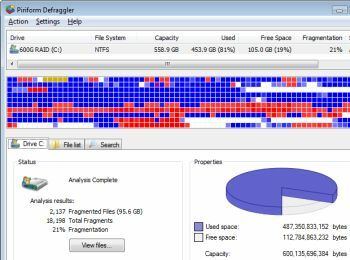 Piriform's Defraggler 2.0 offers a number of advantages over the defragmentation tool that's built into Windows. For starters, you can choose what you want to "defrag": selected files, selected folders, or your entire hard drive. It also has a "quick defrag" option that can give your drive a tune-up in a matter of minutes. Like Windows' Disk Defragmenter, Defraggler 2.0 can be set to run at designated times. Unlike DD, it provides a lovely visual drive map that shows just how fragmented your drive is. Version 2.0 adds various interface improvements, better Windows 7 compatibility, and the option to run "offline" when your PC boots. If your system seems slow, I recommend giving Disk Defraggler a try. It's free, easy to use, and definitely better than what's built into Windows.